Fifteen years ago, while working at IBM, John Simonette walked by a Mayo Clinic mobile blood drive on the IBM campus in Rochester and thought, “Hey, why not?” A few years later, he transitioned to a role at Mayo Clinic and has been a dedicated blood donor ever since. Now a Senior Workstation Specialist (a.k.a., computer technician), Simonette has donated 98 times, which is 11 gallons of blood that may have impacted the lives of more than 294 people. Besides being an active blood donor, Simonette also has a rare blood type, AB positive, which only includes 3.4% of the general population. His blood type is beneficial for people needing plasma and platelets since it is universal and can be used for all patients regardless of their blood types. Simonette encourages his children as well as other family and friends to donate—no matter how busy their lives may be. 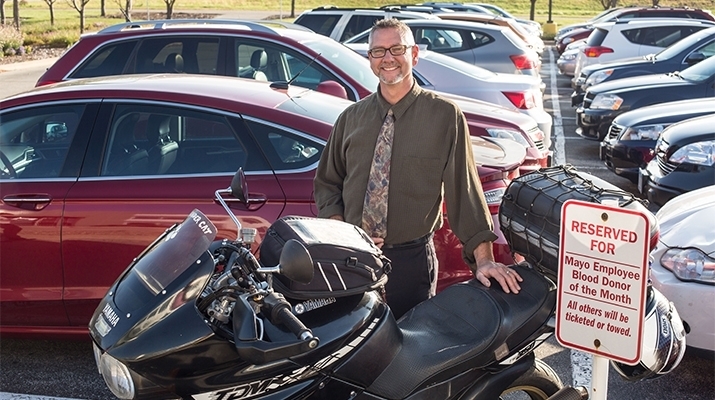 When he isn’t focused on reaching his 100th donation, Simonette loves to ride his motorcycle, a 1992 Yamaha TDM850, or drive his black ’68 Cadillac. Having worked at the Superior Drive Support Center for more than 10 years, Simonette enjoys the convenience of the mobile blood drives and the friendliness of the blood donor staff.